The Interfit STR109 Flash Gun Bounce Set consists of several devices used to gather or disperse the light from your on-camera flash head. By using the touch-fastener strap around your flash you can mix and match each item together for quick and easy results. Each will fit in your kit bag with ease. This kit is ideal for indoor or outdoor use. The Honeycomb can be combined with either the bounce card or tube, and is the essential tool for guiding the light on to the background. The touch-fastener strap measures 10" (26cm) and has a rubberized back to help prevent slipping. The Bounce Tube measures 9.5 x 8" (24.5 x 21cm) with a highly reflective silver base to enhance the range of flash; with black on the other side it can make an effective gobo for stopping the light in that direction. 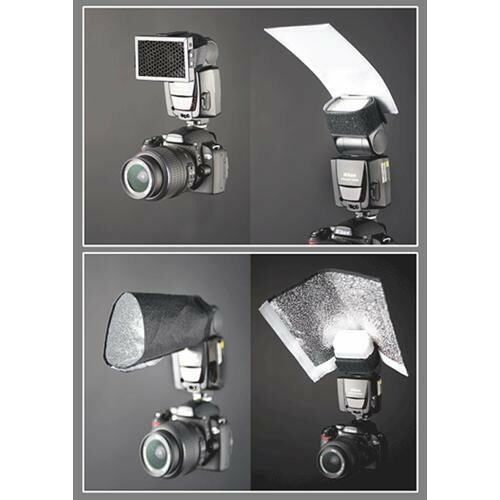 The Bounce Card measures 7.5 x 4" (19 x 10cm) and has a soft white easy-clean surface for creating catchlights. Box Dimensions (LxWxH) 13.4 x 7.6 x 1.8"
STR109 Flash Gun Bounce Set is rated 3.0 out of 5 by 1. Rated 3 out of 5 by Mitchell P. from Strobies flash mod kit by Interfit I use the grids on my flash to create a natural vignette. The snoot also is useful. I like to use different things to modify my flash, I will use these regularly. They are affordable the only down side was the container bag uses velcro to open and close, and all of the modifiers have velcro so they get stuck trying to put them away.